When McCain said he was confident that he would win with a surge in the wee hours of November 5th during the final counting was there more truth in this statement than he was letting on? Two weeks ago, former Bush operative Karl Rove was confidently saying that John McCain could win ten battleground states to become President. Monday, the day before the election, Republican IT specialist Mike Connell, a Karl Rove protégé, was forced to testify in front of a Cleveland federal judge about a number of serious allegations with regards to hijacking vote results in Ohio during the 2004 presidential election. Interestingly, Karl Rove changed his tune after the testimony and said on the eve of the election that Barack Obama would win in a landslide. Could cyber-attacks and manipulation of transmitted vote tallies still have occurred in Minnesota - like what was described during Mike Connell's testimony the day before - altering vote tallies in the Presidential and Senate elections as they were tabulated throughout the early morning hours of November 5th? Of course the Presidential election turned out to be a landslide and so attempts at fraud would have been overwhelmed by the lopsided victory for Barack Obama. However, the Senate race between Republican incumbent Norm Coleman and Democratic challenger Al Franken was always expected to be very close. And these expectations did not disappoint. A neck and neck running vote tally occurred throughout the night with numerous lead changes and by Wednesday morning Norm Coleman had a slight lead of 762 votes in the uncertified results. This lead was however well within the guidelines of Minnesota election law dictating a recount by hand of the paper ballots if the final difference between candidates is within 0.5% of the total votes cast. In this case a 762 vote difference out of 2.9 million votes cast was a difference of only 0.01%, well within the designated 0.5% that would trigger an automatic recount. Since Wednesday morning, a number of clerical errors and final vote tallies have created adjustments in the vote totals for both candidates and has made the race even tighter. Currently an unofficial tally of 221 votes separates Republican Norm Coleman and DFLer Al Franken. Secretary of State Mark Ritchie said that adjustments in the days following the election are a normal part of the canvassing process. Counties must certify their results today, then send their results to the state by Friday. The state of Minnesota has until November 18th to certify the election. After this, the election recount will start and is expected to take a few weeks. In the meantime the two competing campaigns have begun firing accusations at each other. One of the more serious accusations involves a Norm Coleman staffer that acted as a Somali translator on election day and at one point a GOP challenger and was accused of trying to illegally influence Somali voters at the polling place to cast votes for Norm Coleman. A very serious allegation if proven true. Saturday lawyers representing Sen. Norm Coleman's campaign lost a legal battle trying to suppress the opening and counting of 32 absentee ballots. A Ramsey County judge denied Coleman's request. Those ballots were opened and counted on Saturday afternoon and the results were expected to be delivered to the state on Monday. An Associated Press story over the weekend discovered there were as many as 25,000 "undervotes" where voters picked a President but apparently did not vote in the Senate race and many of these "undervotes" occurred in heavily democratic voting precincts. While some of these "undervotes" are expected to occur, especially in a bitter mud-slinging contest such as the Franken – Coleman race, it is also possible that many other ballots might have been incorrectly marked or were misread by the optical scanning machines. These are ballots that are expected to be discovered during a manual hand recount. It has also been reported that the error rate for the optical scanning machines can be as high as 2 ballots missed for every 1000 counted. This could mean an additional 6000 uncounted ballots could be discovered and counted during the hand recount. Because this race was so closely watched and blogged about, we were able to find time-stamped voting results for both Al Franken and Norm Coleman throughout the night. Dozens of internet sources were cross-checked and the timepoints of the results were compiled and graphed over the course of the evening. These snap-tallies are apparently submitted to various media outlets via the internet from the Secretary of State election center and are also displayed on the Minnesota Secretary of State Election website throughout the night. During this process a number of irregularities were discovered. 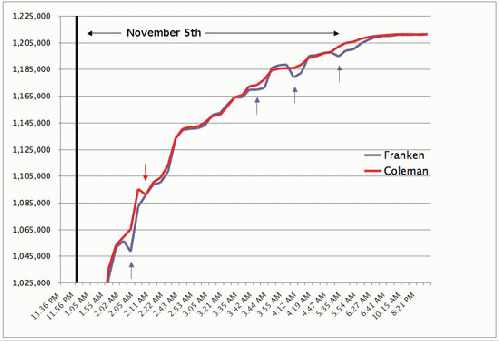 At four different points in the night vote tallies for Al Franken decreased significantly even as tallies for Norm Coleman continued to increase from the previous timed tally. These four points are indicated on the graph below by the arrows. Decreases in Al Franken's tally of 7903 votes occurred at 2:04 am, 105 votes at 3:42 am, 9529 votes at 3:58 am, and 3313 votes at 5:20 am. A total of 20,850 votes appear to have been subtracted from Al Franken's total throughout the evening. At only one point that we could determine was there a decrease in Norm Coleman's vote tally. This occurred at 2:09 am where 4252 votes were subtracted. It is not immediately clear how or why a vote tally for only one candidate could decrease relative to an increase seen by the other candidate. Keep in mind that these were vote total results that were found recorded on various websites across the internet. Most of the numbers were verified in duplicate from different sources. The times indicated were normalized for Central Standard time and are as accurate as is possible for this type of data collection. Also keep in mind that the logging of vote tallies by media outlets and the Secretary of State website most likely included many more timepoints throughout the night than what we were able to find recorded by citizen bloggers. Nevertheless, the large subtraction of almost 10,000 votes from Al Franken's tally did not go unnoticed on the blogosphere. Franken is missing almost 10,000 votes!"